Castleford Tigers became the first team to lose a live Sky game in a golden point extra-time as they went down 21-20 in an ultimately thrilling derby at Leeds Rhinos. The Tigers were not really in the game for the first hour, but charged back from 20-4 down to 20-all and had big chances to win it in the 80 minutes only to have the points snatched away from them by Brad Dwyer's long range drop-goal in extra-time. When Trent Merrin went over for the Rhinos' fourth try after 52 minutes and Cameron Smith added the conversion it looked all over with Cas out of sorts and their defence again being found wanting. But from 16 points down they found something that had been missing and dominated the final quarter. Peter Mata'utia sent Greg Minikin over for a try that was goaled by half-time substitute Calum Turner and at 20-10 on the hour it was suddenly game on. Two minutes later the big Tigers following were celebrating again as Chris Clarkson went over against his former club after a brilliant offload by Grant Millington and a quick pass by the supporting Paul McShane. Turner added his second goal. It was all Cas now as Jake Trueman and Liam Watts both went close and they scored a third try on 70 minutes with Alex Foster producing a fantastic dive to ground Mata'utia's grubber kick over the line. Unfortunately, Turner missed the kickable conversion, leaving the scores level. The Tigers were unlucky not to have edged in front as Trueman's drop-goal sent the ball through the posts, but a controversial penalty was given against Watts for an alleged block on Dwyer. Whether or not the interference was deliberate was open to debate, but Dwyer had also looked offside from the play the ball so Cas had right to feel aggrieved. In a frantic finish Trueman sent another drop-goal attempt just wide while Liam Sutcliffe fell short with a drop-goal attempt for the hosts. The last play saw Cas march downfield to get underneath the posts, but instead of setting up Trueman for what would have been a winning drop-goal attempt McShane decided to go for the line himself and was tackled just short. With the Tigers having to kick-off into extra-time they never laid a hand on the ball as the Rhinos drove to just over half-way and Dwyer - who had never landed a drop-goal in his career - managed to send a long range kick just over the crossbar to win the match for his team. It was a cruel end to the match for Daryl Powell's men, but earlier they were second best. Cas could not have made much of a worse start as they gave a penalty away on the very first play of the game and were behind within three minutes. Konrad Hurrell brushed off opposite number Greg Minikin and charged over on a determined race to the line to score the first try. Liam Sutcliffe's conversion attempt hit the post. 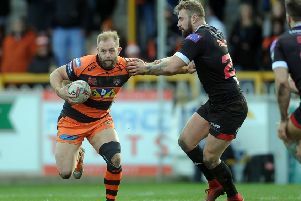 The Tigers dug in and got themselves level when Liam Watts ran the ball on a sixth tackle play, sold a nice dummy to open up a small gap and ground the ball over the line despite the attentions of three Rhinos player. In the absence of the injured Jordan Rankin, the goal kicking job was given to Peter Mata'utia and he hit the post with his first conversion attempt. Cas immediately messed up when Minikin and James Clare failed to deal with the restart and Leeds were straight back on the attack. Cameron Smith was held up over the line then Hurrell thought he had scored his second try only to have his effort chalked off for obstruction against Jamie Jones-Buchanan in the build-up. The video referee ruled against the Rhinos again soon after when Tom Briscoe touched down in the right corner, but Kallum Watkins knocked on as he got his fingertips to a high kick. There was no stopping Ash Handley, however, as he dived over in the corner from a Hurrell pass with the Cas defence again a bit soft down their right edge. Remarkably, a third kick hit the post as Sutcliffe's conversion attempt bounced back off an upright. Sutcliffe did add two points from a penalty just before half-time to make it 10-4. Just before that it was the Tigers' turn to rightly have a try chalked off by video referee James Child after Adam Milner tried to dart over from acting-half on a last tackle play, but was denied as a home player got his arm under the ball. Into the second half Leeds stretched their lead when Trueman's attacking kick was well blocked by Kallum Watkins, who charged downfield. Turner did well to tackle him, but with the Tigers defence stretched Jack Walker sent Sutcliffe over for a try that was not goaled. Merrin's try, created by Dwyer's offload, followed by Smith's goal made it 20-4 before the big turnaround in the last 20 minutes. Scorers - Leeds: Tries Hurrell, Handley, Sutcliffe Merrin; goals Sutcliffe, Smith; drop-goal Dwyer. Castleford: Tries Watts, MInikin, Clarkson, Foster; goals Turner 2. Leeds Rhinos: Walker; Briscoe, Watkins, Hurrell, Handley, Sutcliffe, Myler; Peteru, Dwyer, Oledzki, Jones-Buchanan, Smith, Merrin. Subs: Parcell, Donaldson, Singleton, Holroyd. Castleford Tigers: Mata'utia; Clare, Minikin, Shenton, Eden; Trueman, McShane; Watts, Milner, Millington, Sene-Lefao, Foster, Holmes. Subs: Moors, Cook, Turner, Clarkson.